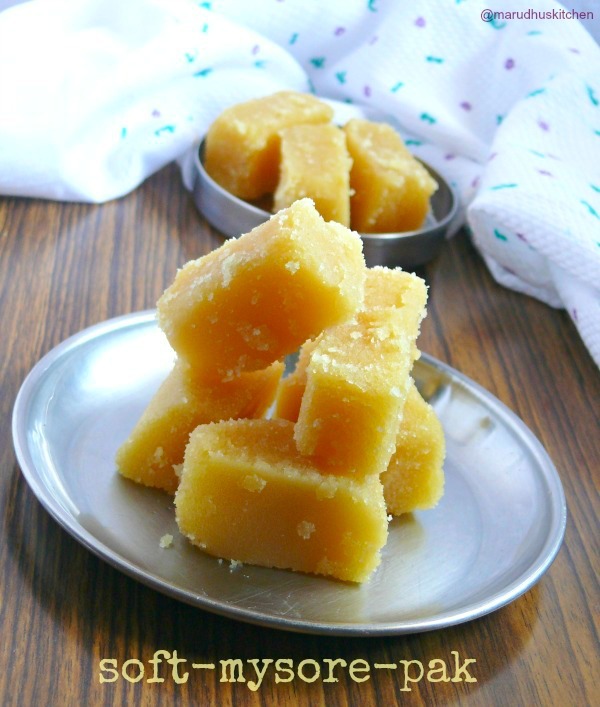 During my school-age I never had a great appreciation for this sweet even though am crazy about sweets.But,now as a passionate cook I never miss to try variety of dishes and when it comes to mysore pak sweet recipe! I was targeting for successful outcome of this for quiet a long time.Usually two types are made the first type is porous and will have crumbly texture and the other is the soft one which melts in your mouth. I was trying for the softer version!and I was successful in making it. It was as soft and delicate as it is available in “krishna” sweets.It was total shocker surprise for me really!I found out that sugar syrup consistency and the final stages of bubbling mysore pa is totally inevitable seconds to concentrate for a successful soft mysore pak sweet recipe.It seems in shops they add turmeric powder for color!so that it is more attractive,but here its our own choice.Hope this step by step pictured post will be a good guide to every one who wants to try this mysore pak sweet recipe. Keep the flame low when doing this recipe. 1.Fry flour in a tsp of ghee till raw smell goes. 2.Sieve it and keep aside(mix ghee and oil into one bowl keep ready). 3.Now add sugar and immerse it with water in a kadai and let it boil. 4.Boil till above shown consistency. 5.Now check for 1 string consistency. 6.After this add sieved flour and stir without lumps. 7. After stirring nicely add ghee and oil mixture little by little. 8. use all the ghee. 9..Then switch off the stove when you are able to make ball as shown. 10.Tranfer the contents to a greased container. 11.After ten minutes you can cut to desired shapes. 12.Remove the slices when it is completely cool. Fry flour in a tsp of ghee till raw smell goes. Sieve it and keep aside(mix ghee and oil in one bowl and keep ready). Now add sugar and immerse it with water in a kadai and let it boil. Boil till above shown consistency or continue till 1 string is reached. Now check for 1 string consistency. After this add sieved flour and stir without lumps. After stirring nicely add ghee and oil mixture little by little. Then switch off the stove when you are able to make ball as shown. Tranfer the contents to a greased container. After ten minutes you can cut to desired shapes. Remove the slices when it is completely cool. Always grease a suitable plate in advance and keep ready. The consistency at the end is important.If you are able to make a ball it is the correct stage to switch off.If you want you can melt the ghee in advance or leave it. mouthwatering recipe…..really love it…nice pictures too ! 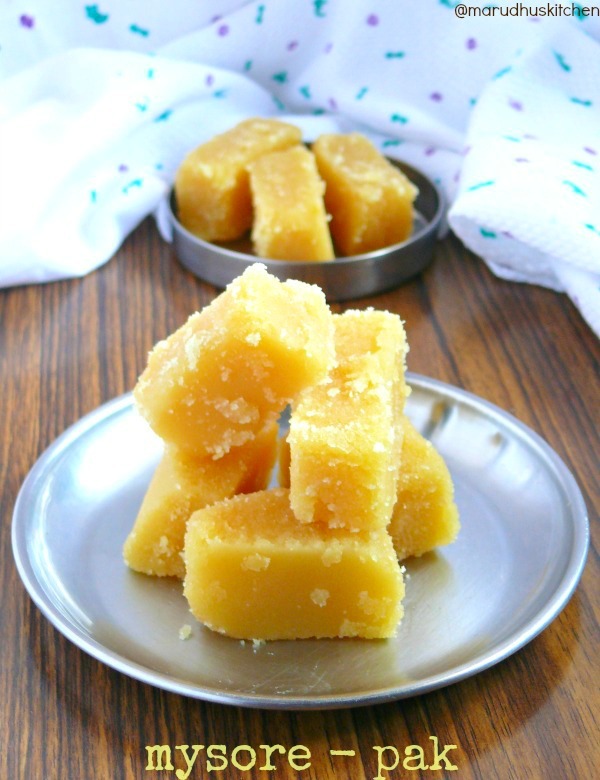 Melting mysore pak is my all time fav. perfectly done. wow! 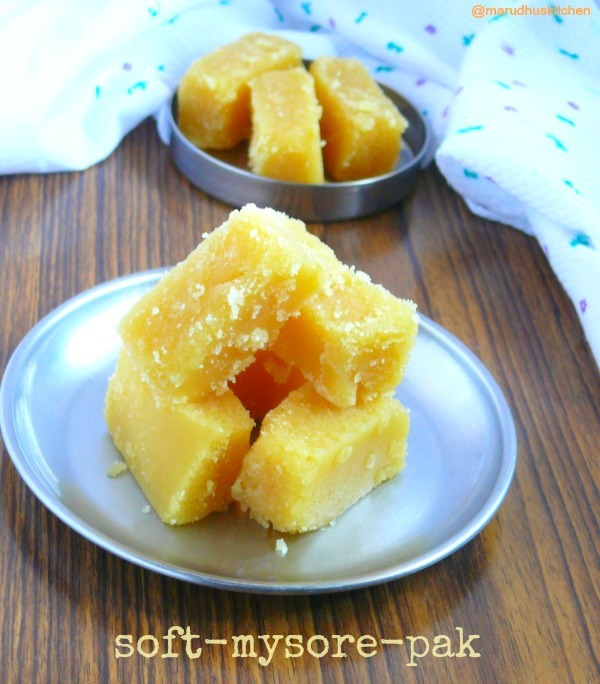 mysore pak looks soft and delicious.tempting. wish to have one. looks perfect.Nice n soft.Remembering Bangalore sweet stalls!